If you run an eCommerce store or promote any kind of products or services on your site, then you will know the power of customer reviews and testimonials. Unfortunately there are a few issues surrounding reviews which mean that attracting them, and receiving their full benefit, isn’t as straightforward as it could be. On problem is that, even if your products are great and your customers are happy with your service, getting reviews isn’t easy. Additionally, while customer reviews are a powerful marketing tool, if you are not doing anything to verify the authenticity of the reviewers, you could be failing to make the most of the feedback left on your site. Fortunately there is a new service out there which makes the process of obtaining reviews from customers that little bit easier, as well as presenting them in a way which makes them more believable and authentic. Yotpo is a free service (for sites with up to 1 million page views per month) which allows you to easily publish social reviews on a website, including WordPress sites running WooCommerce. Once you’ve created a free Yotpo account you can install the free WordPress plugin and begin gathering and publishing social reviews for your WordPress site. Once setup, you will then be able to connect customer reviews with the author’s social media account, letting other users put a face to name while adding a level of authenticity that an anonymous review just can’t provide. The service also shows any connections that exist between those browsing your site and the authors of the reviews, giving them an extra level of authenticity and believability. But how does the service make getting reviews easier? 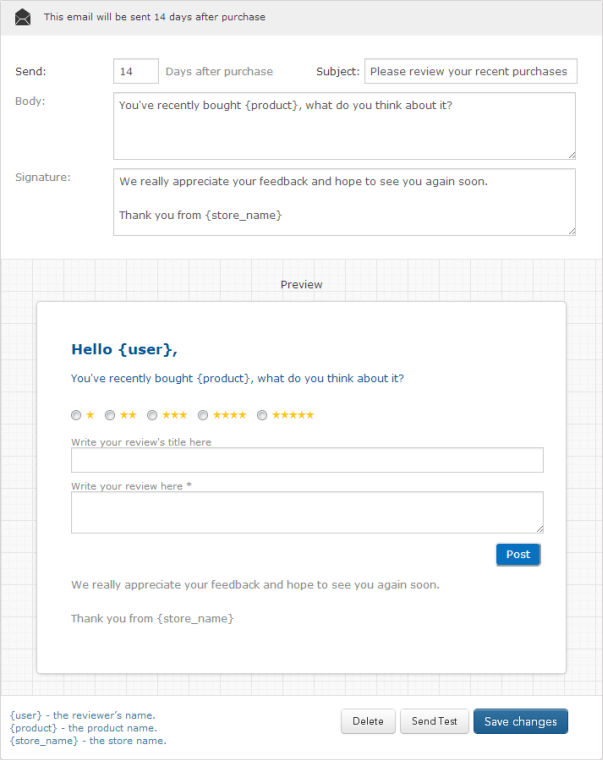 An eCommerce site running Yotpo can be setup to contact customers once they have made a purchase, asking them for their feedback. The amount of time to elapse after a purchase has been made can be customised to allow for the delivery and the use of the product, before asking for feedback. The review can be written directly from the email the customer receives, saving them the effort of logging back into your site, thereby increasing the likelihood they will make a submission. Users can even leave reviews directly from the inbox of their smartphone, further increasing the chances of them submitting a review. The review form also allows for easy posting to the customer’s, and your, social media profiles, helping to spread the word about your products and services. Another feature of Yotpo, which works with the Mail After Purchase feature, is the ability to offer discount coupons to your customers in order to encourage them to leave a review, and also turn them into repeat customers. Setting up a coupon is very simple. There are two options to choose from when it comes to setting how customers can earn a coupon. 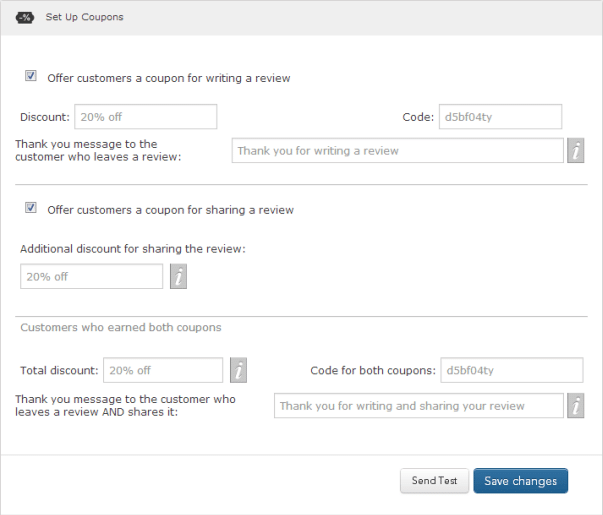 Customers can be awarded a coupon for writing a review, or for sharing a review or you can give them a double discount for doing both. The discount amount can be set as a percentage of the product price. The coupon notification email also contains images and links to similar products to those that they previously purchased to help tempt them back to your eCommerce store to shop again. 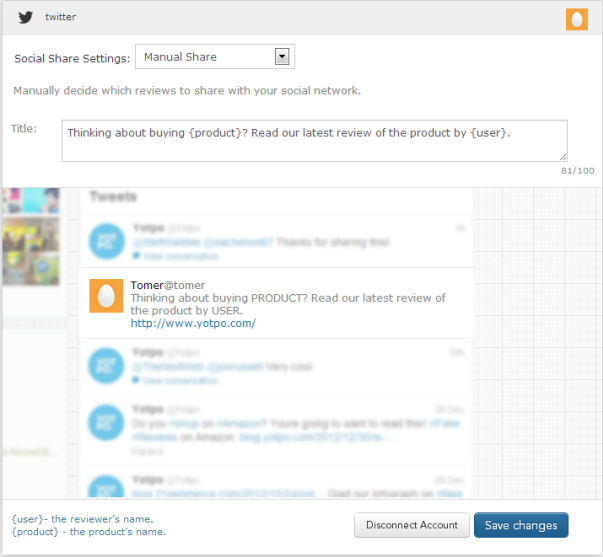 Yotpo can also be setup to automatically share reviews left on your site across your social media profiles. Those who are following you or your store on Twitter or Facebook will be able to see any reviews that are left and for what products. To be on the safe side, unless you are highly confident your customers will love your product, you can manually moderate comments before they are posted to your social profiles. The service can also create a testimonials tab for your Facebook page. 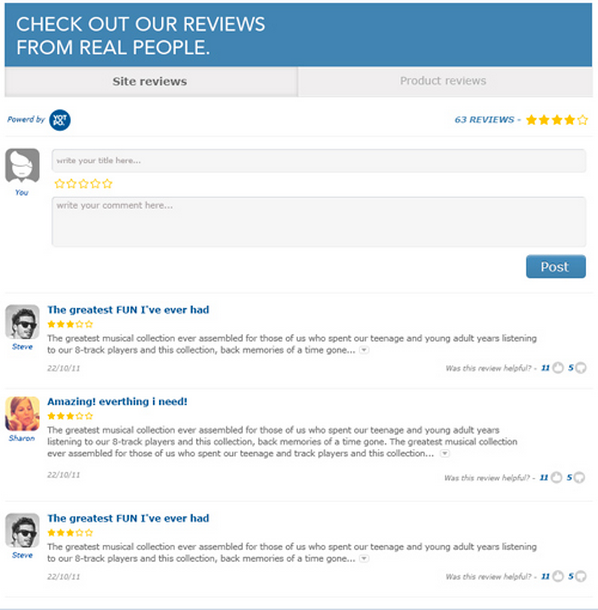 When users visit this page they can easily see the feedback left by your customers. This social proof can go a long way to helping them to decide whether to make a purchase or not. The Mail After Purchase emails can also be configured to display a selection of related products, or those of your choosing, to help increase the chances of a further purchase. If you’ve been collecting customer reviews and testimonials the hard way then you will be pleased to know that you can import existing reviews into Yotpo. You can also easily export any testimonials that were left through the Yotpo service for your site. 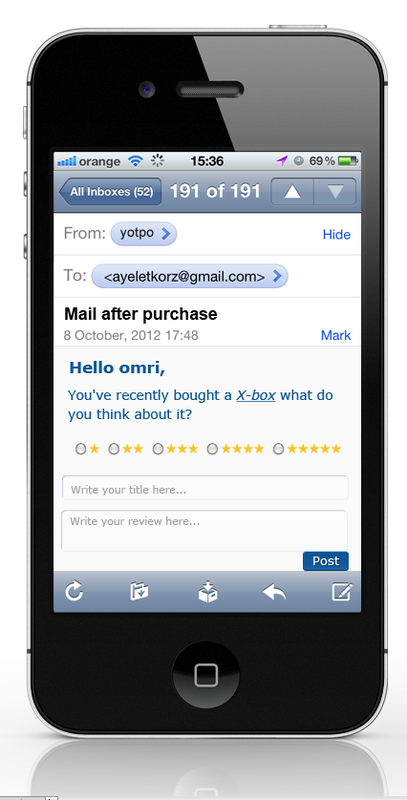 The Mail After Purchase feature isn’t the only way to receive reviews from your customers. 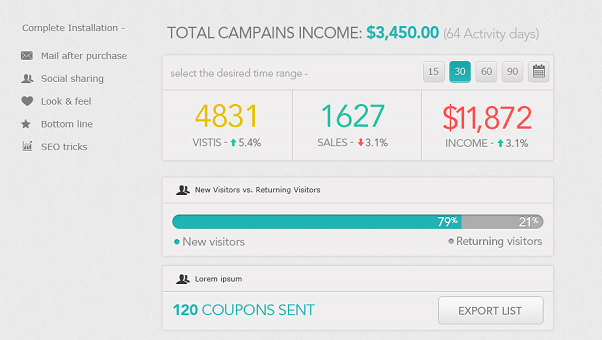 From the Yotpo dashboard you can also design a sidebar widget your customers can leave their reviews through. 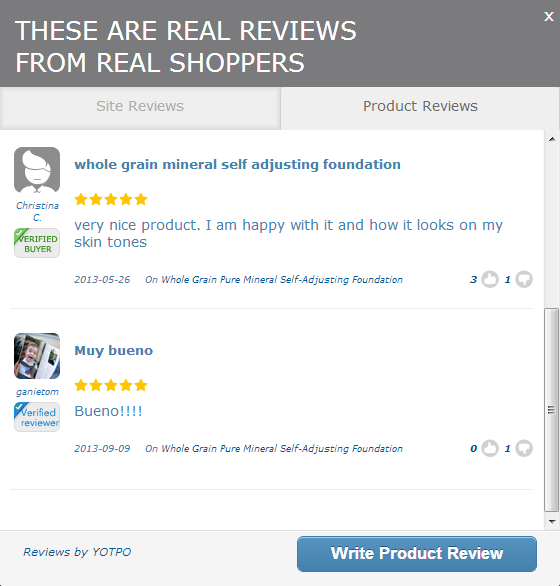 Customers can then post and view the reviews left on your site in the sidebar of your WordPress store. When it comes to support for Yotpo, for a free service, there is a good set of resources available. There are guides for many of the different platforms the service can be used with, including WooCommerce for WordPress users. There is also the ability to submit a support request. The plugin, and the service itself, are very easy to use. You can start off with just implementing an easy way for customers to leave a review, or you can go all in and setup the email after purchase feature and begin offering discount coupons for those that leave and share reviews. With so many great features, it does make you wonder how they can offer this service, and support it for free. Perhaps section 8 of the TOS can shed some light on this, as it appears to indicate that the reviews become the (joint) property of Yotpo once they’ve been submitted. If you want a quick and easy, not to mention free, way of dealing with social reviews from your customers then Yotpo looks like a great choice, just make sure you read the terms of service first! Thanks so much for such a great write up on Yotpo. I welcome any of your readers that have any questions about Yotpo to write a comment or to tweet us @yotpo.